Luxury Waterfront Living at its finest! 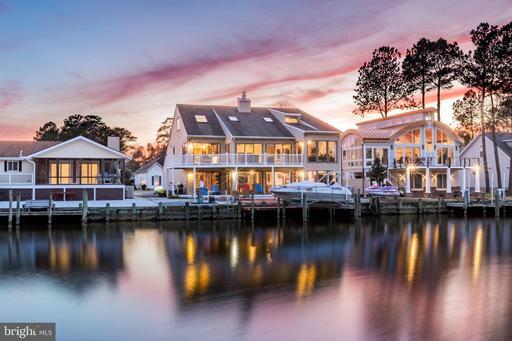 Let the Wight Bay and Ocean City skyline be the panoramic views you wake up to and the sunsets you enjoy in this 5,400+sqft custom home in prestigious Terns Landing. Experience all your Outdoor Living Dreams come to life here with a 10,000lb Boat Lift, 2 Jet Ski Lifts, Heated Outdoor Saltwater Pool, Outdoor Sound System and spacious Deck and Yard space for entertaining. With custom finishes in every room, the interior of this extraordinary home offers an ideal floor plan for every lifestyle. Enter the home through etched glass doors into a cathedral ceiling Great Room with floor to ceiling windows that showcase the sparkling Wight Bay and imagine being serenaded by the piano sitting in the entryway under the sweeping, curved staircase of your grand foyer. The spacious open layout of the first floor is designed to entertain, offering a First Floor In-Law Suite, a Billiard room connecting the Great Room with a 2-way Gas Fireplace, Formal Dining Room with back-lit tray ceiling, Breakfast Room, Family Room with Gas Fireplace and a fully equipped Luxury/Commercial Kitchen featuring 2 Islands with Granite Counters, Viking Appliances, 6-burner gas stove and full size wine fridge. On the second floor you'll find a luxurious Bay Front Master Suite with his/hers walk-in closets, Gym Room, heated tile floors, granite double vanities, 3-fixture shower and a Mansfield Jacuzzi tub. Second floor also offers 2 more Suite-style Bedrooms with private bath, a Theater Room/Game Room with separate bath (or 5th Bedroom) and second Laundry Room. Additional Features include: 3 Car Garage, Mud Room with Laundry Room and Dog Bath, 6 Zone GeoThermal Heating system, Instant Hot Water, 10 Zone In-Ground Irrigation, 3 Zone Indoor/Outdoor Sound System and Video Security System. This contempory 5 bedroom, 3.5 bath 4000 sq. ft. house or a house/builder of your choice can be built on this beautiful one of a kind 40,225 sq. 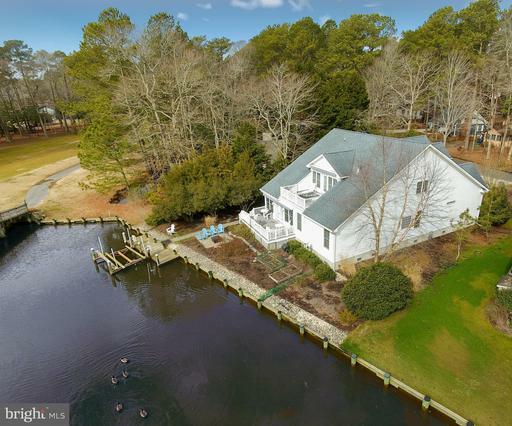 ft. point lot with 250 ft. of waterfront including panoramic views of canal, bay, creek and the Ocean City skyline. Also included is an 80 ft. dock on navigable deep water with easy access to restaurants on the bay and the Ocean City inlet.. Located in the Ocean Pines community with many amenities including: Golf, Yacht Club/restaurant, oceanfront beach club, indoor and outdoor pools, playgrounds, hiking trails and community police, fire and emergency services. See MLS #1001559396 for the purchase of only the lot and the disclosures without the house. Would you like a Wide Open Panoramic View with the Ocean City skyline as a backdrop? Would you like to have the option of 2 Boat Lifts instead of only 1, and plenty of room for 2 PWC Lifts? Over 140 ft of bulkhead, maintained by the Homeowners Association, instead of you personally, and located on a point at the end of a cul-de-sac? Southeastern exposure offers morning sun and afternoon shade on your soon to be built waterfront deck & patio. 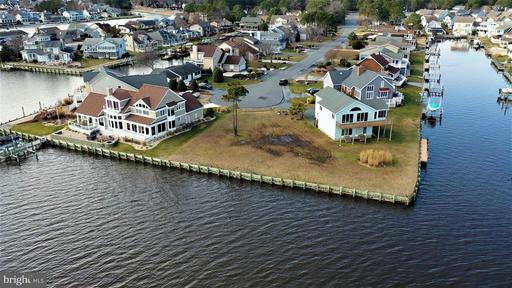 This is one of the most premier waterfront undeveloped lots remaining, offering you the opportunity to design and build your dream home, not only in Ocean Pines, but in the Ocean City area. Take a look for yourself and compare. Survey on file shows BLDG Envelope 6,281 Sq Ft. Call for allowable build-able area. New Vinyl Bulkheading being installed early 2019 by the OPA, will eliminate some issues after you build your Dream Home. Magnificent home on both the water and on the golf course! 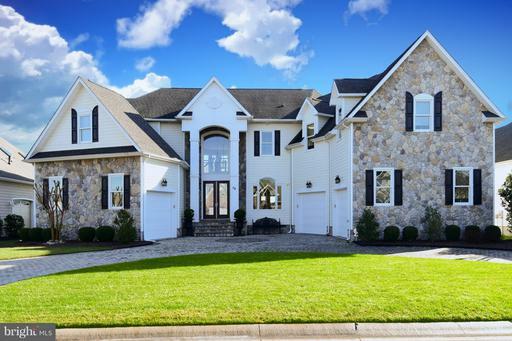 This home has beautiful 2015 updates and amazing waterfront privacy. Three master bedrooms suites, two of which are waterfront. The huge open great room with hickory hardwood flooring has a sitting area with vented gas fireplace, a dining area, and a waterfront entertaining area. The recent kitchen update includes quartz counter tops, superior SS appliances, and breakfast bar -- leading to the entertainment island with granite counter top. This home is filled with beautiful windows and abundant sunlight. 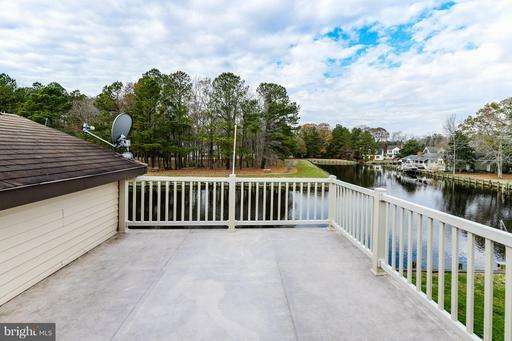 There are two waterfront decks with awnings and with awesome views of the 4th tee. Additional features of this home: Dual HVAC, new Rinnai tankless hot water heater, crown molding, tray ceiling, 2 pantries, 7 ceiling fans, 4 beautiful full bathrooms, abundant closets and attic storage, maintenance free outside, boat dock and boat lift, southern exposure for all day sunshine, sunset views to the right up the canal, vegetable and flower gardens. Ocean Pines is ranked as the safest community in Maryland and as one of the top places to retire. Amenities include: 5 pools, including one indoor pool and one located at the oceanfront beach club; an 18 hole golf course; a racquet sports complex with pickleball, tennis and platform tennis; many parks, playgrounds and walking trails; a Yacht Club; two marinas; a Community Center with an active Rec & Parks program. There truly is no other community like it on the Eastern Shore. Only 5 miles to the beach and boardwalk! NEW PRICE - This absolutely is one of a kind huge waterfront home in Ocean Pines. If you like entertaining and enjoy life, this is the home for you! Situated on the point of a wide, deep canal, you are mere minutes and easy access to the open bay, without any bridges. Two personal jetski lifts and own boat slip with lift right outside your door. The lower level is perfect for the good life and has a sauna, bar, pool table, tv viewing area - plenty of space for all your guests to hang out after a day on the water. The main living area boasts granite kitchen, waterfront master bedroom, a great room with fireplace with ceiling to wall windows to take in the wonderful water views. Or step out onto one of balconies to sit and watch boats. Upstairs are additional bedrooms with more views and there are two more bedrooms on lower level, one walks out to dock. Don't miss seeing this very unique home! 1 Year Warranty Included. And don't forget the credit - use it to make it your own! Call for a private showing. 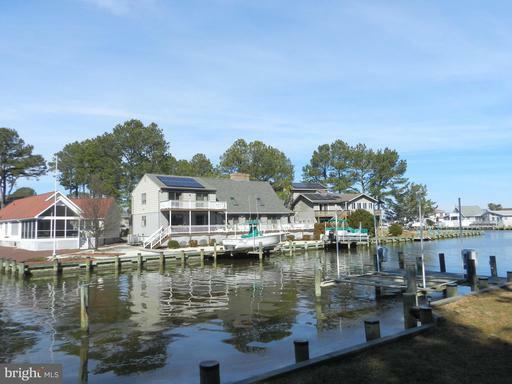 Active Solar Contemporary located at the end of a cul-de-sac with over 130 ft. of bulkhead and two 10,000 lb. boat lifts, just around the corner from open water. Home offers 2 masters, one on each level. Newer HVAC with a pellet stove in the Great Room and a wood burning fireplace in the Sitting Room/Loft Area. The air lock foyer, 2in.x6in. exterior walls, Andersen windows/sliders, Southeast exposure, and solar panels assist greatly with your utility costs. Hobbyists and Craftsman will appreciate the over-sized 2 car garage w/2 Electric Panels @ 200amp each and I-Beam w/Chain Hoist, concrete floored crawl space 6 blocks high, and the 18ft.x7ft. Hobby Room on the 2nd level adjacent to the walk-in cedar closet. This is a very unique home that shows well on a very nice bulkheaded waterfront lot. Furniture negotiable outside Contract. Beautiful one of a kind 40,225 sq. ft. point building lot with 250 ft. of maintenance free waterfront including panoramic views of canal, bay, creek and the Ocean City skyline. Also included is an 80 ft. dock on navigable deep water with easy access to beaches and restaurants on the bay and the Ocean City inlet. Ready for you to build your dream home. Located in the Ocean Pines community with many amenities including: Golf and club house, Yacht Club/restaurant, Oceanfront beach club, indoor and outdoor pools, playgrounds, hiking trails and community police, fire and emergency services. See MLS #1001973510 for suggested new construction house.